A quick update on Wear & Tear (2). 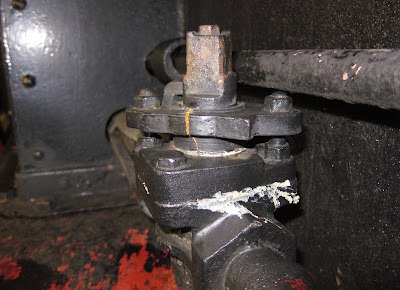 I've replaced all three joints from the steam end of the Sentinel 7109's cab mounted boiler feed pump; these are the ones above and below the valve chest and the failed one sealing the end cover. 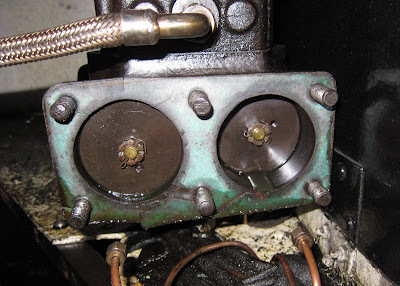 The valve chest ones were undamaged but I replaced them anyway to improve long term reliability. 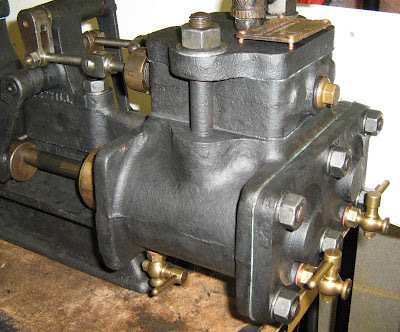 When the pump's end cover joint failed, for unknown reasons steam got into the water end of the pump. This has happened once before and I've never worked out the cause. 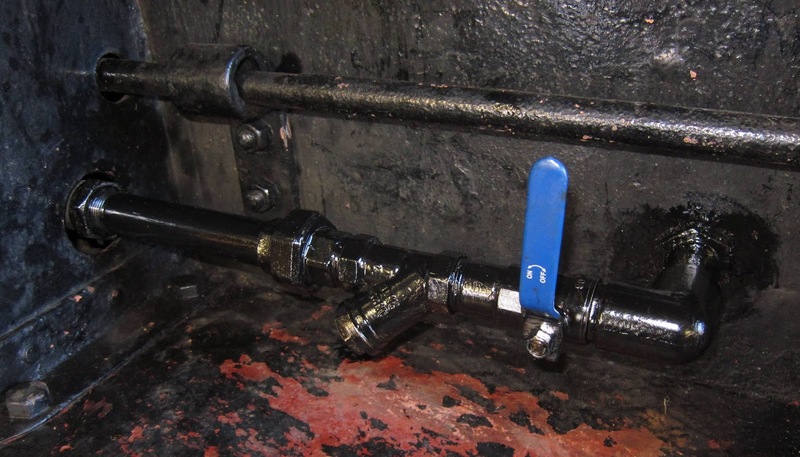 I can speculate about the check valve to the boiler getting wedged open to allow hot water back into the feed pipe but I don't actually know. Perhaps the check valve could stay open if the feed water and boiler water were at identical pressures? This is not likely as there is a spring to help the check valve to close. This mystery remains on the 'too difficult' pile. I checked the cleanliness of all three check valves for peace of mind and found no cause for concern. 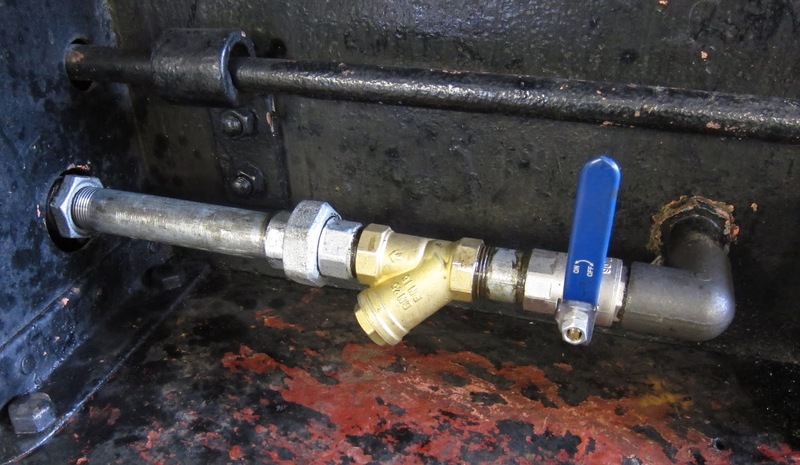 Not only did the steam get back into the pump's water cylinders but also further upstream in the pipework towards the water tank feed. I mention this because I'd just painstakingly replaced it all (click here) after the frost damage to the original water valve. Being a water feed, I again used 'Heldite' as the thread sealant as it was well in spec for cold water and low pressure. However, it's not designed for high pressure steam! The result was that the pipe joints were emptied of the Heldite and no longer doing their job. I've rebuilt the pipework again; this time I've used Rocol's 'Steamseal' as the thread sealant. The name gives it away so next time it should withstand a steam ingress where it's not wanted. The water cylinder piston rings are made of a fibrous non-metallic material. (click here for more detail). They survived steam ingress the previous time and seemingly this time also as the pump worked well when tested with compressed air. After three years of reliable service, Sentinel 7109's cab boiler feed pump decided it was going to play games and started spitting steam out of the steam cylinder end cover joint. This early photo shows the light green layer between cylinders and the end cover. The material I used for the joint was Klinger's Klingersil C-4400. I'd bought this in 2010. Its spec shows that it can withstand about 23bar pressure at 230degC. All seemed satisfactory as water boils at approximately 230degC when at 19bar pressure. The next photo shows the effect of three years' use (and possibly the recent heavy frost?). There are splits in many places which makes me wonder if there may have been some frost involved but that is speculation. In retrospect, what is more to the point is that, while the spec shows the joint material is good for 230 degC and 19bar, the steam supply to the pump has passed through the superheater and is likely to be somewhat hotter than the figure I had originally assumed. I'm thus rather surprised it had lasted as this long! 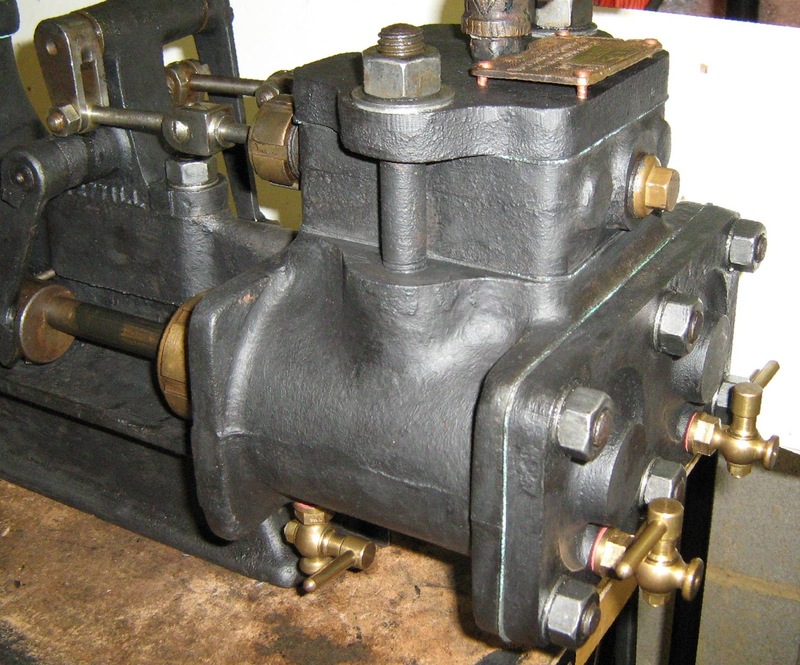 Later in the restoration process, for all steam joints, I'd switched to a higher spec joint material, namely Klinger's Kingergraphite PSM/AS. More details here. So that's what will be used for the repair. I can say I now have more (hard-earned) experience! Sentinel 7109 has been hauling trains for nearly three years now and inevitably pulling 75 tons of carriages repeatedly up a 1 in 50 hill is going to ask a lot of a little engine. Late in 2018, from time to time a knocking noise was heard from underneath and investigation showed that the main steam pipe had lost some insulation due to abrasion against a support bracket. 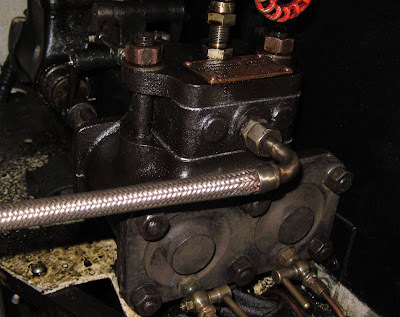 At the front of the water tank and just behind the rear engine, I had reinstalled the main steam pipe and included a support bracket using (from memory) existing mounting holes. Main steam pipe with bright red support bracket. The main steam pipe connects the regulator body to the 'Y' pipe fitting in the engine compartment. 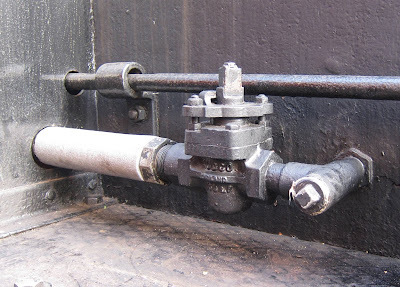 As far as I can tell from photos I took in 2004, there were no support brackets for the main steam pipe between its ends. This did not seem satisfactory to me and hence the addition of extra support. However, not everything works out quite as anticipated and the bracket had been wearing the insulation allowing hard surfaces to knock together. The pipe clearly moves about when Joyce is in motion. On removing the bracket, it appears that the wear had not abraded the actual metal of the pipe but I'm glad I found it now and had not let it get any worse. 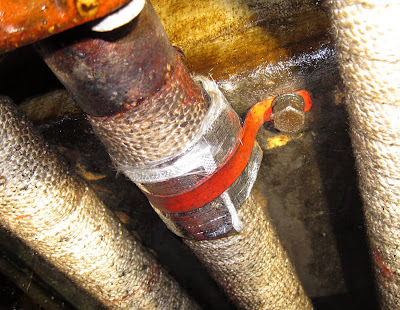 It would appear that the bracket was too restrictive and probably with too small an area in contact with the pipe. However, I still want the extra support but with more give than it had. I've wrapped some Aluminium-clad fibre glass sheet around the bracket to cushion the support from the pipe so that it is supported but not clamped. Now to see how it behaves. (I have some other ideas if this doesn't last). Sentinel 7109 was surprised by a sudden frost in early February 2019 and suffered some damage to the pipework feeding the cab's boiler feed pump. In June 2013, I wrote extensively about the construction of an elaborate plug valve with a hidden secret. It was originally fitted in 1928 so was a historical gem. 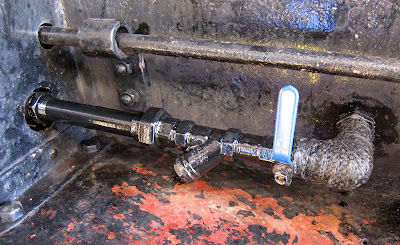 Plug valve in water feed line. However, after the frost, I found it looking rather sorry for itself. On taking it apart, I realised that it was beyond repair as the internal plug itself had split into two pieces. It's a shame to lose an original part in this way but it was also an opportunity. I suspect the 1928 construction had perhaps been done in a hurry; Joyce was a prototype after all. Where the pipe came from the tank to the 'T' piece, a strainer was hidden across the top of the 'T'. 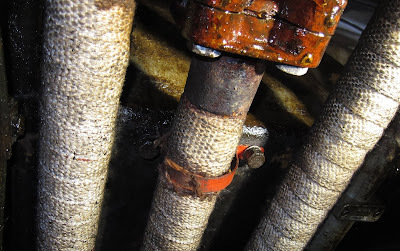 The valve was downstream of the strainer. 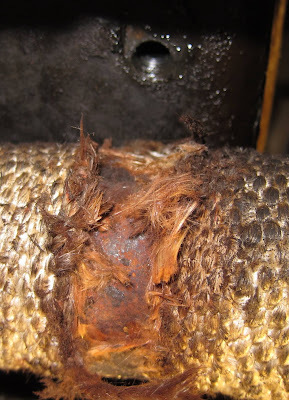 There was a disadvantage with this in that to clear the strainer by removing the plug from the end of the 'T', the tank had to be emptied to avoid a personal irrigation. So the valve should have been upstream of the strainer! 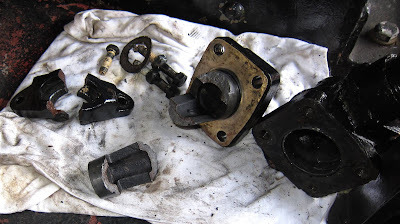 I've resorted to modern parts to rebuild the valve and strainer with the disadvantage removed. The pressure on the ball valve is only the head of the water in the tank, about 6 feet max., so there are minimal requirements for it. 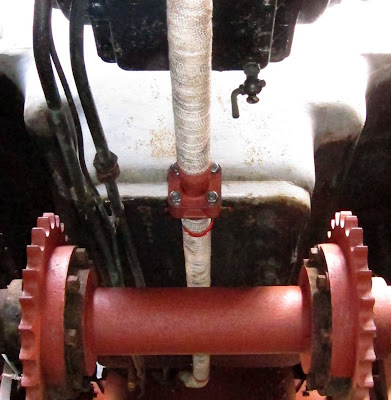 The 'Y' strainer is now downstream of the valve and the strainer's cap (pointing downwards) can also be used to drain the water pipe for frost precautions as well as cleaning the strainer. With any luck, the new strainer will be less restrictive than the old one so the water pump should be more efficient. I'll tidy up the appearance in due course [as below].